Laurence Capossele was the guest of honour, alongside Guy Sidos (President and CEO of Vicat Group), for the 6th “Innovate to win” – the event “created by entrepreneurs for entrepreneurs” – which took place on March 21 at the WTC in Grenoble. Laurence Capossele gave herself over to the original round table staging and “started back in the classroom” to discuss her early years and the founding of Cetup with her partner, Jean-Pierre Capossele. Then, our CEO “came to her position as CEO” to review the history of Cetup: an urban courier service that became an expert in dedicated transport in France and in Europe. Laurence Capossele spoke of Cetup’s work, its team’s strong commitment to carrying out assignments that combine quality and security, as well as the various milestones in the company’s development over the last 30 years. The last leg of her journey, ending “by the fireside”, gave Laurence Capossele the opportunity to share some insider secrets with her peers in the audience. 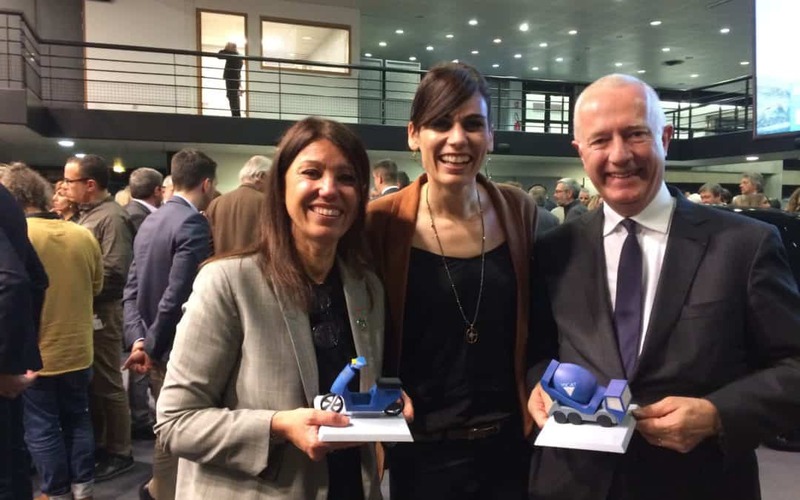 The event ended with a keepsake trophy awarded to the speakers: a truck mixer for Guy Sidos and a scooter for Laurence Capossele, in a nod to the very beginning of Cetup’s business.